I was going to have a Wordless Wednesday post today since Mom is having surgery this morning, but our South Carolina Gamecocks just won the College World Series and are the National Champs in baseball. We've never won this so the whole state is extremely excited! Go Gamecocks!!! It's Tummy Tuesday. Time for a snorgle! Pee ess - Mom's shoulder surgery is tomorrow at 9:00 am EST. I'll try to post some pictures for the next few days but probably won't get the chance to visit anyone. Special purrs for Neala today for her surgery. As I told you in an earlier post, Mom finally got home Friday night after being gone all week. I've been pulling the finicky routine on her and will only eat my stinky goodness if she puts it on her finger or buries treats in it. I'm also ignoring her quite a bit as you can see by the fev-ver just laying on the floor and me walking by it. Maybe this will teach her not to leave me for long periods of time again! I just love to give my Mom a hard time. It drives her crazy! It has been so HOT in SC for the month of June. I think I've found one of the coolest places in the house: underneath mom's keyboard in the office directly below the AC vent. Stay cool, my furriends! Mom is home where she belongs! As soon as she got home and got on the computer to check up on everything, I perched myself at her feet under the computer and gave her the look that got me my treats! Would you turn down this face? Whew! It's finally Friday and Mom will be home this afternoon after being on the road everyday. I pulled a "finicky" routine on Mom on Wednesday night and wouldn't eat my new food for her. She opened a new can on Thursday and I ate it all up. I love giving mom a hard time; especially when she leaves me home alone! Mom got home last night around 9:45 pm. She's on the road again today and tomorrow, but we had a short little reunion. She had enough time to take this quick photo of us together and said she's sorry about the laser eyes, but she was too tired to keep chasing me to get a picture. Mom says she is giving me a kiss from Auntie Deb, too! 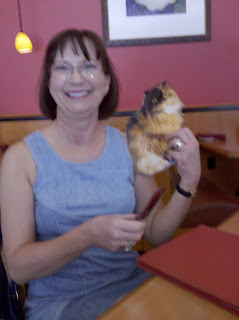 Mom did get to visit with the Taylor Catsssss yesterday. She was so busy giving scritches and pets to all of the kitties that she didn't get too many pictures made with her camera. However, Auntie Deb took bunches of photos and promised to send them. 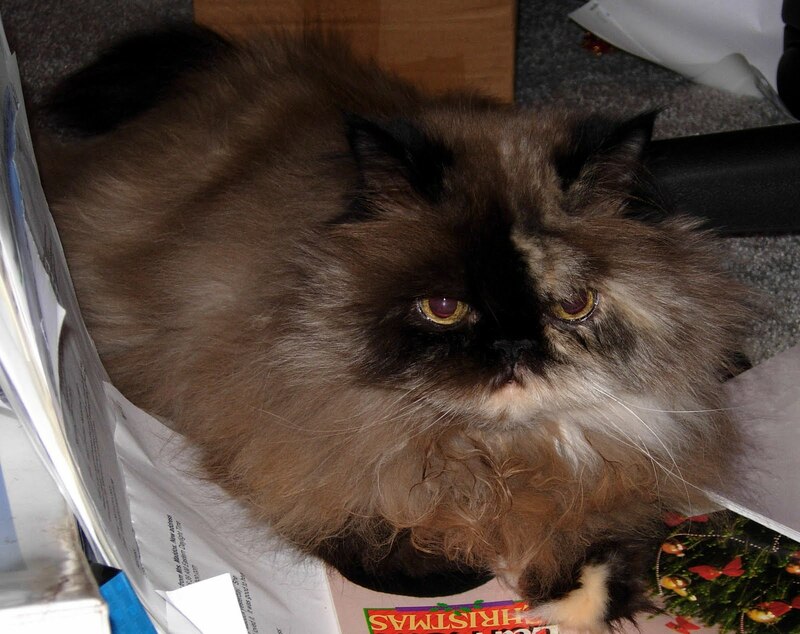 I was very sneaky though, I flattened and shrunk myself and hid in mom's computer bag, so Flat Praline was able to visit Auntie Deb and the Taylor Catsssss. Our first stop was at a wonderful Italian Restaurant in Maryland. This picture is very small because mom took it with her phone. Mom had crab ravioli in a rich cream sauce. Our next stop was to Auntie Deb's house. I got to meet Spats, Seaborne, Sassy, Summer and Sam. Meanwhile, I'm at home trying to figure out how to get into the treats since Grandma Bean left the package on the couch. Mom has a meeting in Washington, D.C. this week, so my grandma bean will be taking care of me. But guess who she is meeting this afternoon? Auntie Deb of the Taylor Catsssss!!! No fair! I want to meet Auntie Deb, too! Mom said she would take some pictures. She doesn't know if she is going to meet any of the Taylor Catsssss or not, but she is so excited about meeting Auntie Deb. Maybe Flat Praline needs to sneak into mom's bags! Just a reminder that the Auction ends tonight at 12:00 midnight. The list below is a confirmation of the orders for the Prayer/Memorial beads. If there are any errors, please let mom know at pag4usc@sc.rr.com. 5. Rebecca Elliott - Prayer beads with St. Francis charm. 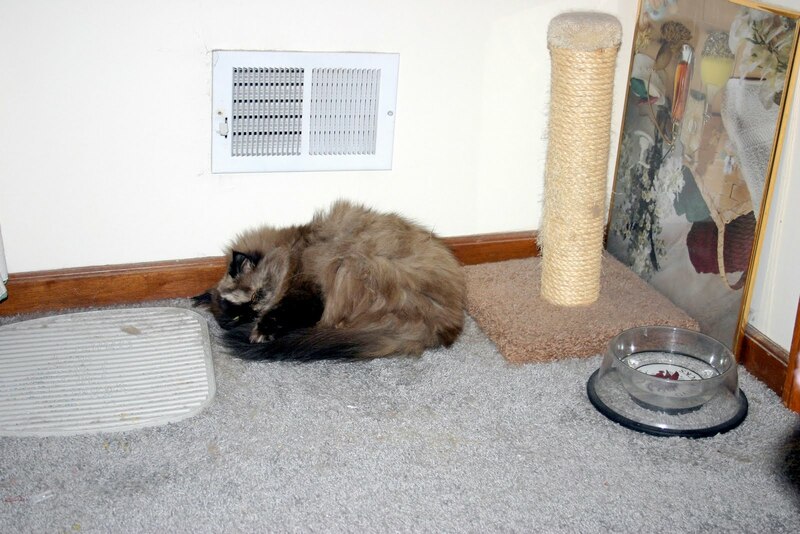 This is one of my favorite places to take it easy when it is so hot outside: right underneath the AC vent. Happy Father's Day to all of the dads out there! Let's see: 1, 2, 3, 4, 5, . . . Mom! There are supposed to be six cans of stinky goodness here. I only count 5. Where did you hide the sixth can? Oh yeah! I already ate it! Guess it's time to get 6 more! Mancats have Mancat Monday and we ladycats have never really had a special day to showcase our feminine wiles and beauty. Well, no more! We ladycats are now celebrating Friday as "Femme Friday." I am ladycat, hear me roar! Don't mess with a ladycat on a mission! Now, just where did mom hide those treats? Pee ess - many of you have asked about my tummy since I've settled on my newest canned food and I am doing great! Mom says she's never seen me eat so well in my 14 years. I clean my plate in one sitting and I've never done that before. I'm so thankful for all of my furriends that are helping out with my recent vet bills from my surgery in April by donating to and/or bidding on items in Gracie's auction on the CB. If you haven't visited the auction site yet, please do so. There are some great items up for auction and the memorial/prayer bracelets are a big hit. The last day to bid on an item or to purchase a memorial/prayer bracelet is midnight Sunday. Even if you can't support with green papers at this time, I ask for your continued good wishes and purrayers that I stay in good health for a while. 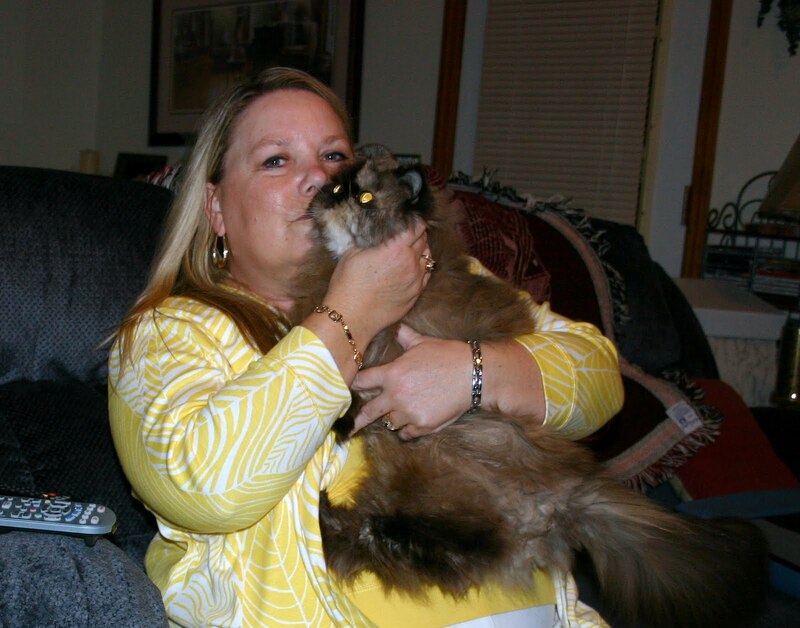 Also, please say some extra purrayers for my mom and her upcoming shoulder surgery in less than 2 weeks. The debate between Mom and me concerning my new stinky goodness is over, for now! Mom is feeding me the new stinky goodness only once a day (1/3 a can) and my tummy appears to be handling it well. I like this food and it's good for me! Oops! 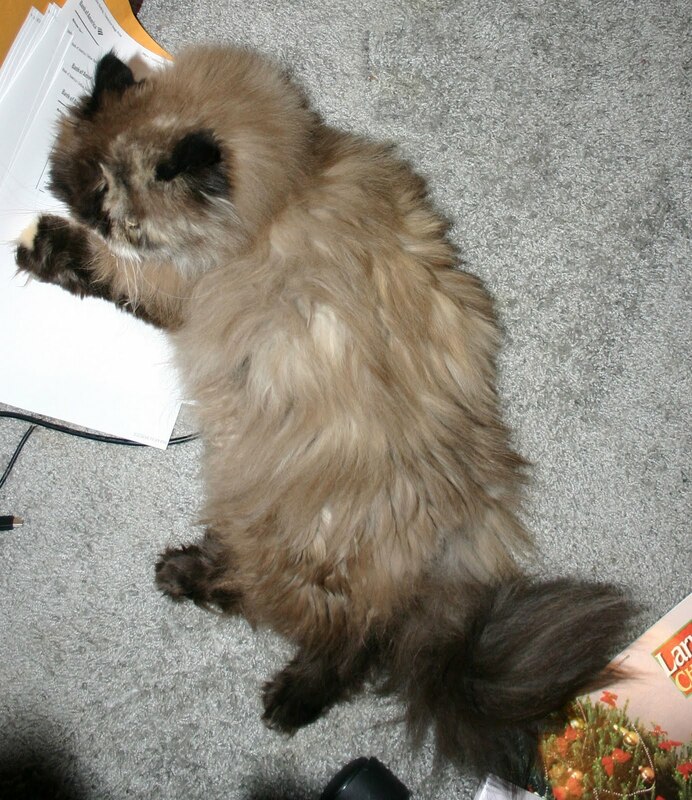 Looks like mom hasn't brushed my floof yet and I'm a little disheveled! Quick, Mom, get the brush! I just love getting my belly rubbed! This is an older video, but many of you who have become my furriends in the last year may not have seen it. Can you hear me purr? Wow! The heat index in SC has been in the 100s yesterday and today. I think I'll just take it easy in the cool air-conditioned house today. 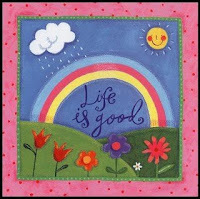 Have a restful Sunday! I still love the taste of my Blue Buffalo stinky goodness, but last night after using my litter box appropriately, I went outside of the litter box on a piece of mom's clothing. I didn't have diarrhea, but but the stool wasn't normal like usual. Mom fears that the new food may be too rich for my delicate tummy. As you can see, after putting some on a plate, she gave up and then started just getting some on her finger for me to try. I would smell it, back up, and then just stare at her. I still like the new food she brought home on Wednesday. Mom thinks that maybe I could eat a little less of the "rich" food and then maybe my tummy wouldn't get upset. Pee ess - for those of you who may be worried that I will starve, I do eat my dry food and it is high quality: Royal Canin Persian 30 and I do drink my water. The vet just recommended that I also eat some canned food each day to make sure I have plenty of water. Still keeping my paws crossed that the new food won't upset my tummy. The ingredients are a little different from what I'm used to. I was still eating great yesterday, but mom said she is only going to buy a couple of cans at a time to make sure I can handle it well. I found a stinky goodness that I liked. Mom tried two different flavors of the Wellness and I wouldn't eat them. Last night, she decided to try the Blue Buffalo. First, she put some on her fingers and guess what? I ate it! 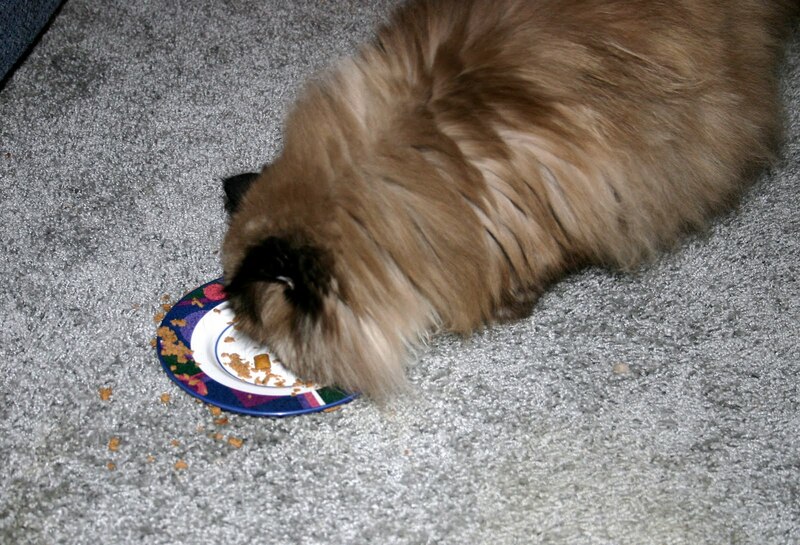 She then put the plate on the floor in the living room (so she could watch me) and I came back for another nibble. Next thing she knew, I was eating! 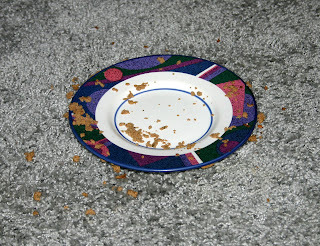 I think you could hear mom celebrate a mile away when I cleaned my plate. Mom even gave me a second helping since I hadn't eaten any stinky goodness since Tuesday morning and I cleaned my plate again. You can tell how much I liked the flavor because I made a mess all over the carpet! Now to see how this new food works with my system! At least for today, I'm a member of the Clean Plate Club again. 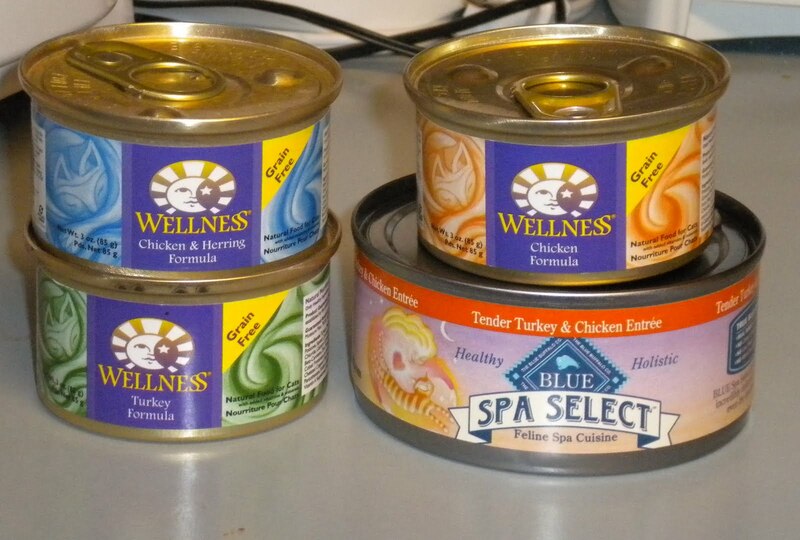 This is the brand/variety that I liked: Blue Buffalo Spa Select Tender Turkey and Chicken Entree. 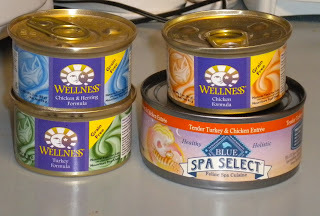 The turkey and chicken in our recipe provides all the essential amino acids your cat needs on a daily basis. Hearty whole grains like brown rice and barley supply the complex carbohydrates that your cat needs for energy. Whole carrots and sweet potatoes, cranberries and blueberries...these are just some of the nutrient–rich fruits and veggies you’ll find in Spa Select. Bad day! Mom did go to the pet store to get my stinky goodness and they didn't have any! She talked to the nice gentleman, Clint, who always orders it for us and he said it was being discontinued and he couldn't get anymore. He even called the store across town to see if they had any more and they didn't. Before I show you the stinky goodness that I like, some of you are going to be in shock! It's a Nutro brand, but mom always checked to make sure it wasn't one of the dangerous foods on the recall list. She kept buying it for me because I was doing so well with it. Maybe it was meant to be discontinued. Who knows? 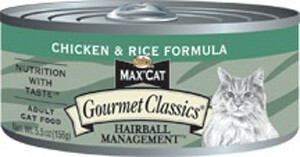 I can't help it, I liked this food and it really kept the hairballs down. Mom did find a store on the west coast that claims to have this in stock, so mom ordered a case. It'll probably be a week before it comes in, but she is going to try to mix it in with some new food to help with the transition. Say good-bye to my favorite stinky goodness! I guess we'll boycott Nutro now! However, in the meantime, I've got to have some stinky goodness! The vet says as a senior ladycat, I need my stinky goodness to keep me hydrated. 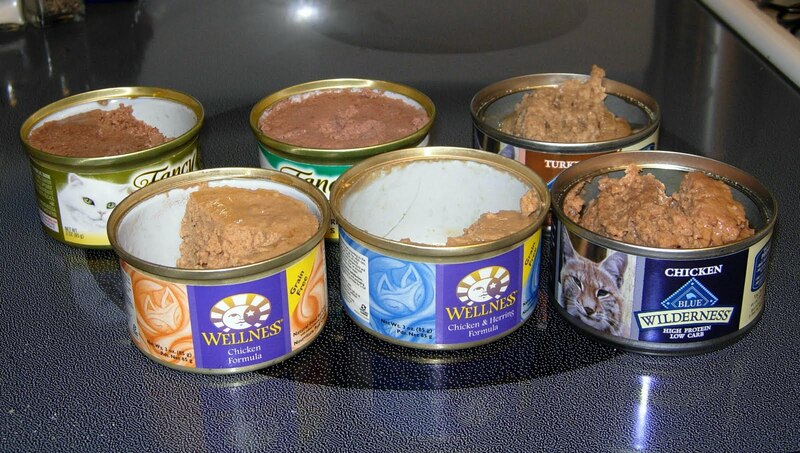 The nice guy at the pet store suggested the food below. Mom opened the Wellness Chicken flavor last night and I took one whiff and turned up my nose and walked away. Mom even put some on her fingers and I wouldn't touch it. She tried to mix my treats in with it and I won't touch it. Mom even tried mixing in some of my current stinky goodness (from the last can) and I will eat it and eat around the new stuff. I don't like stinky goodness that has chunks and gravy in it and I don't like strong smelling stinky goodness. Keep your paws crossed that I will like one of the remaining flavors. If anyone has any recommendations, mom is desperate! I tend to like "chicken" flavored stuff. My mom received this award from Herman's mom: Karen. Your turn, Mom! Thanks, Karen. This award is for us Moms who help our kitties blog. Answer the questions, then pick five Moms to pass it along to. 1. What would your prefect day consist of? A day with no pain and no bills to worry about. 2. How would you describe yourself if you were an item of clothing? A favorite worn-out, bulky sweater. Comfortable to have around even if there are some flaws. 3. What hobbies are you currently working on? Just had my first vocal concert. Trying to learn some new songs. 4. Walking in the woods in wellies or bare foot on the beach? Barefoot on the beach, always! 5. Have you ever hugged or sang to a tree? Last time I did that, I think I got chiggers. 6. Growing your own veggies or nipping to the supermarket? Nipping to the supermarket. Don't have the patience to grow my own. Will take home grown from any volunteers. 7. Have you found anyone exciting in your family tree? Yes, even though I have blonde hair and blue eyes, I have Cherokee Indian in my ancestry (just a few generations ago) . 8. Slap up meal in a posh restaurant or fish ‘n’ chips from the wrapper? Love a meal in a posh restaurant, but finances usually require the fish n chips from the wrapper (as long there is vinegar for them). 9. Which element do you most resonate with, Earth, Air, Fire or water? Water. I'm a Pisces and I at my most peaceful when at the ocean! 10. Do you believe in fairies? Must agree with Karen on this one. Most of the time, but then sometimes I get all rational and think I'm being silly. Now, how's that for a Wordy Wednesday??? Mom forgot my stinky goodness again yesterday!!! 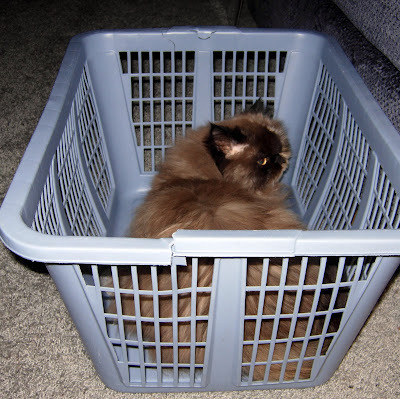 I think I am becoming a basket case. What will I do without my special noms? What, Mom? I don't care if you left before the sun yesterday and got back home after dark after being on the road for 13 hours - you forgot my food!!! Mom Paula: I sure hope the pet store has her special food. They usually have to order it for me. Shhhhhh! Don't tell Praline! Mom had to get up early this morning to drive to one of her grant sites (three hours away), so I told her not to wake me while she was leaving. I think I'll just stay in my empty clothes basket today. Pee ess - Mom, please don't forget to get some more stinky goodness. I'm down to one can! Whew! I'm tired. Mom has her first vocal concert tonight, so she'll be running around like a chicken with its head cut off! 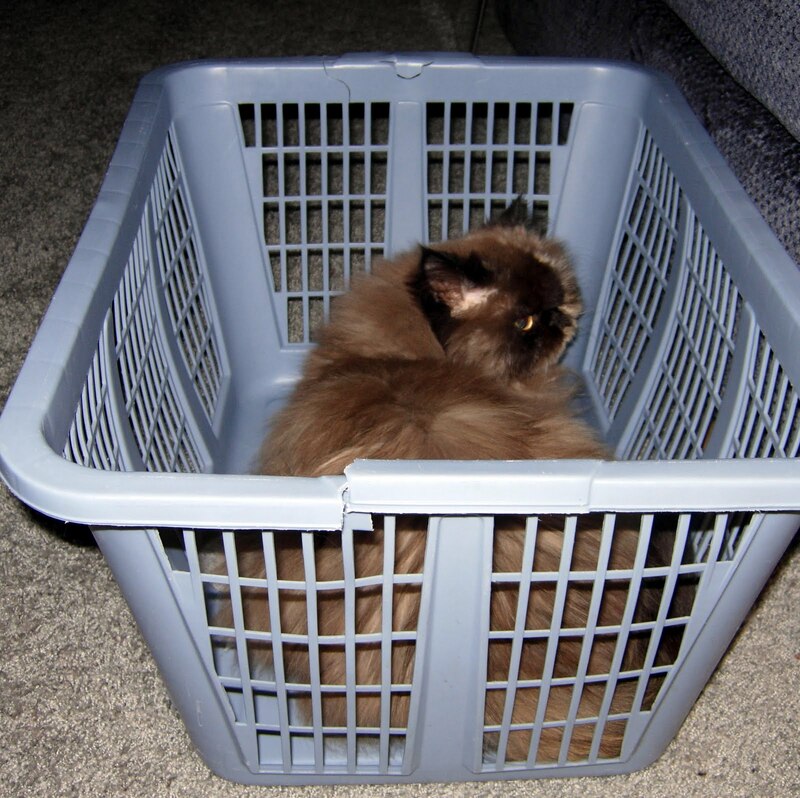 I think I'll just rest here in my basket. I like it when it is empty; not full of clothes. Don't you just love my new blog layout! Thanks, Ann! Today is my second blogoversary. I can't believe that I have been with the CB for 2 years. I've met so many great furriends, both woofies and kitties. I may complain about my mom sometimes, but would you believe she has helped me to blog every single day! We have not missed a day yet, even during her surgery in December. For my 2nd Blogoversary, I wanted to share a glamour shot with you. Mom is doing pretty well with some of the natural light. Of course, it takes about 10 photos to get one that isn't blurry. My floof is a little ruffled because Mom was snuggling me up close and she messed up my floof. She says it makes me look like a floofy lion. Did you hear that Dante? Thank you to everyone who stopped by to help me celebrate my blogoversary. Mom says we'll wait to have a big party for my 15th birthday in September. Love to all of you! For a short week, this sure has been a long week. Mom continues to put in 10 hour days at work to try and catch up and get ahead before her surgery. I'm down to 3 cans of stinky goodness, so she better stop by the pet store on the way home tonight. Tomorrow is my 2-year blogoversary! Be sure to come back and visit. I'm a little late with Spring Cleaning this year because I had surgery to remove a Mast Cell Tumor from my face. Thankfully, many of you will remember that it was benign. Unfortunately, it took a lot of green papers. Fortunately, I've recuperated very well from my surgery. Gracie and the CB offered to hold an auction to help with my expenses. I've been spring cleaning to find some items to donate to help out with auction. You can see some of the items here. Thank you, Gracie and the CB for helping us out! 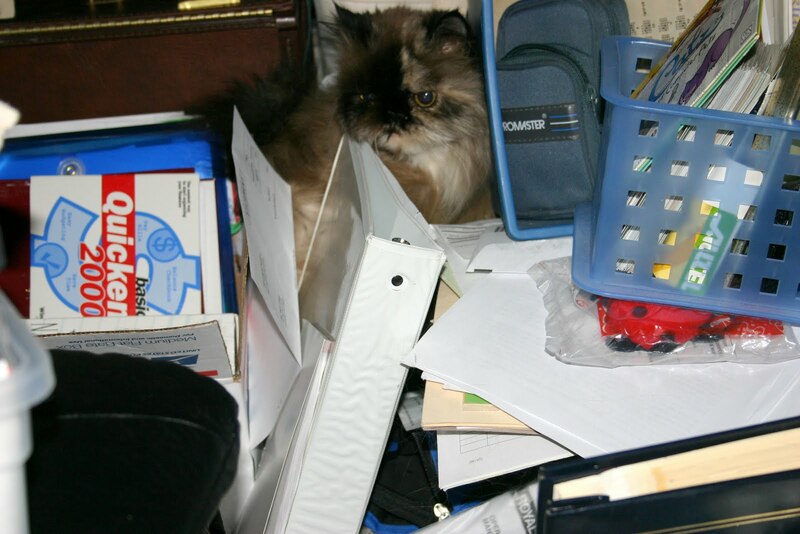 I think mom and I still have a long way to go to clean up this mess. Look how old that software is!!! Come on, Mom. We only have four weeks before you have your surgery and we have a lot to do still! I thought my furriends might like to see what a good old Southern meal looked like. Mom had stewed squash, creamed corn, fried okra, green beans, and a pork loin. The only thing missing was cornbread and canteloup. I guess you can tell by my face that I didn't like what mom was eating. She said it was really good! Especially, considering the fact the my grandma bean cooked it for her! Mom is a little lazy when it comes to cooking. MOL!